The Brewers, like many teams, have their share of underachieving and overachieving players. Still, enough of their success looks legitimate that there's no obvious reason to expect them to decline dramatically, provided they can stay mostly healthy. They seem unlikely to top 95 wins this season, but 88-90 wins are very much within their capabilities. It will likely be up to the rest of the NL Central to catch up to them—and are any of the other NL Central teams capable of 90 wins? Shows what I know -- shortly after I submitted that profile to the Hardball Times' editors for publication, Ben Sheets went on the DL, leaving the Brewers' with rookie Yovani Gallardo as the best remaining starter. From that point on through the end of August, the Brewers lost more games than any other team in the NL Central. This allowed the retooled Cubs, who had previously surged above 0.500, to "catch" and then "pass" the Brewers by playing 0.500-ball through mid-September. And then, over the last two weeks, the Cubs went on a 10 for 12 streak to cement their lead in the NL central, despite a modest surge by the Brewers. It was the Cubs' first postseason appearance since 2003, and gave them a shot at their first NL Championship since 1945. The Cubs used six different catchers over the course of the season, including the opening day starter, Michael Barrett. As of the season's end, however, there were three catchers on the Cubs' roster, headlined by mid-season pickup Jason Kendall. Jason Kendall, now a very old 33 years old, hasn't really been an asset at the plate since he left Pittsburgh, his 0.367 OBP with Oakland last year notwithstanding. This year was the worst of his career, batting a combined 0.244/0.301/0.312 despite an apparent hot streak since arriving in Chicago. The bigger problem with Kendall, however, is his complete lack of throwing ability. Kendall threw out 4% of would-be base stealers this season, the worst rate of any catcher with more than 400 innings behind the plate in major league baseball. Opposing teams knew it too, making 130 attempts against him. Applying linear weights to those stolen bases, opposing clubs earned roughly 10 net runs when Kendall was playing...in just 400 innings. Wow--that's a full win via the running game. Almost unheard of. As a result of Kendall's struggles, by season's end 24 year old Geovany Soto had claimed a significant portion of the playing time. He did it with his stick, slugging 0.375/0.426/0.646 in 54 AB's, while contributing with his arm by throwing out an adequate 29% of opposing base runners. Soto's power surge was an extension of his performance at AAA this season, where he hit 0.353/0.424/0.652 in 385 AB's, slugging 26 home runs, which represented a huge improvement over any other season of his career. It's unlikely, given his track record, that Soto really is this good, but maybe he made some kind of adjustment? His 50-AB PrOPS (0.919), at least, indicates that much of that power is consistent with his batted ball profiles. I wouldn't be surprised to see Soto starting in the postseason, especially given the alternatives (ed: this was written prior to the two postseason games--indeed Soto is starting). Henry Blanco, now 35, had the worst offensive season of his career. Defensively, his 20% CS rate was a bit low for his standards, but it's a small enough sample size that I don't put much stock in it. Nevertheless, in terms of actual production this season, he was nothing short of awful. First base continues to be patrolled by the inimitable Derrick Lee. While not quite on the level of his ridiculous 2005 campaign, Lee, 31, recovered well from his wrist injury to be the Cubs' best offensive player, hitting 0.317/0.400/0.512. PrOPS indicates that this was a moderately lucky performance, as does his BABIP 0.363. Nevertheless, Lee continues to be a dangerous right-handed hitter that anchors his team's offense. Defensively, THT's data indicate that the former Gold Glove winner is an average defender on ground balls, though as highlighted in the Fielding Bible, this misses his above-average ability to save throws from his infielders. Mark DeRosa, one of the major offseason acquisitions last winter, has been the main contributer from second base this season. DeRosa's power slipped slightly following his likely career year in 2006, but he contributed a quality season at second base, hitting 0.294/0.371/0.422. Defensively, THT has him as a touch below average, while RZR has had him a touch above average over the past few years at second. I'd just split the difference, which makes his defense just like his hitting: average. And that's by no means a bad thing--average players don't grow on trees. In 2003, the Pirates traded Aramis Ramirez to the Cubs along with Kenny Lofton and cash for...wait for it...Jose Hernandez, Matt Bruback and Bobby Hill. Whoops. Since then, Ramirez, now 29, has posted four consecutive seasons with a 350+ OBP and a 550+ SLG. Ramirez's power actually declined a tad this season, but it doesn't show up in his slugging percentage because of a slight uptick in his batting average. But any deviations are pretty minor -- he continues to be one of the more consistent and overlooked offensive contributers in baseball. Defensively, THT's data has him as an average fielder, while UZR has shown consistent improvements every year since 2003, all the way up to -1 runs vs. average last season. When the season began, the Cubs were playing former gold glove winner Caesar Izturis, who promptly "hit" 0.246/0.295/0.304. While PrOPS (0.708) indicates that Izturis wasn't quite as bad as his Chicago numbers indicate, the Cubs decided instead to try scrappy 27-year old Ryan Theriot at short instead. Theriot makes great contact (just 8% k-rate), but otherwise didn't hit much better than Izturis, slapping his way to a line of 0.269/0.324/0.350. If he does happen to get on base, however, Theriot was a force on the base paths, stealing 28 bases in 32 attempts for a net of ~3 additional runs. Few baserunners earn that many runs for their team via the stolen base, and I'm sure it will get a lot of talk among TV and Radio commentators. Defensively, Theriot was rated as slightly above average. Not exactly the sort of performance you'd like to see from a no-hit sort of infielder, but at least he isn't hurting them in the field. Daryle Ward, now 32, has primarily served as a left-handed pinch hitter this season. When he's played, he's produced, hitting 0.330/0.439/0.532 in 132 AB's (though he was aided a bit by a 0.388 BABIP). Finally, Mike Fontenot, the second player with a name ending in -ot on the Cubs, has served as a utility infielder this season, and has hit reasonably well (0.283/0.339/0.412) in that role. Defensively, his numbers at second base put him a bit below average, meaning that he's unlikely to come in a defensive replacement with the Cubs' all-around average defensive infield. 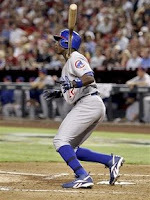 The biggest offseason acquisition in all of baseball--at least in terms of the money--was the Cubs' signing of Alfonso Soriano, who defied RFK Stadium and Leatherpants in '06 and had the best season of his career, both offensively and (thanks to a position change) defensively. Cashing in on an 8-year deal, Soriano regressed closer to the production he's typified since 2002: solid power production, but an aggressive approach that limits his on-base skills while still permitting a significant strikeout rate. Alfonso is absolutely a significant run producer, but is much better suited for the #4 hole than his preferred #1 hole (I know his career numbers are better in the leadoff spot, but I think that's more due to sample size than anything else--surely he can try it again!). 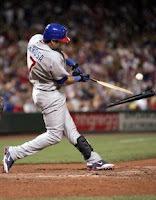 Defensively, despite his protest prior to the '06 season, his move to the outfield has been a real boon for his value. While the offensive standards in left field are higher than in the middle infield, Soriano's speed and athleticism allow him to be a plus defender. THT's stats put him as slightly above average in LF this year, while UZR put him even higher last season and in the first half this season. Center Field has been in flux for the Cubs this season, but the primary starter in CF has been Jacque Jones. Jones, now 32, saw a massive drop in his production this year, declining more than 100 points in slugging percentage and hitting just five home runs all season. He has hit a bit more like his old self since August, but that doesn't make his overall line look particularly impressive. Defensively, however, Jones was a modest standout, posting very good numbers in both left field and center field. Jones' UZR history prior to the '06 season would make me think that these kinds of numbers were more the result of luck than improved defensive abilities, except that Jones' 2006 UZR numbers are also very good. Given the Cubs' overall plus defensive numbers and lack of other defensive standounds, I don't see any way around the conclusion that Jones was at least a bit above average out there...whether that's something that will continue is another question. Next, we come to Cliff Floyd, the part-time starter in right field. Floyd, now 34, had something of a comeback season this year, posting a solid overall batting line of 0.287/0.370/0.427 while sharing time with Matt Murton in left and right field. Floyd doesn't strike out much for a slugger, and gets his share of walks, making him a reasonably good supporting hitter at this stage in his career. His defense, however, has not been good in right field, which largely negated his overall value over replacement. While Jones and Floyd have been the primary starters, in truth they've been sharing a lot of time with Matt Murton and Felix Pie. Murton, last year's starter in left field, found himself in a platoon role with Floyd this season. While he struggled in the first half, the 25-year old came up big in the second half, hitting 0.310/0.375/0.543. Defensively, THT's stats rated him as above average in left field and below average in right field. Last season, UZR rated Murton well above average in left field. Overall, I'd rank him as a plus corner outfielder, and if you use my fielding numbers combined with his offense, his total value ranks above that of Floyd's this season by about nine runs. I'm all for platooning as a way to leverage your talent, but I tend to think that in this case, just letting Murton play every day would be a better choice than exposing the team to Floyd's defensive problems. Murton's not a star, but he's a valuable player with decent power and good on-base skills, and should be that kind of player for years to come. Felix Pie, 22, was given his first taste of the big leagues this season. It didn't go so well, and he ended up spending much of the season in the minor leagues. His AAA numbers showed significant improvement over last season's, however, and given his reputation as an excellent prospect, next year might be his time to break out. He's a wild card in the playoffs--if Pinella decides to gamble and start him in center field, he has the talent and ability to be an October Hero. But he almost might look totally overmatched. At the least, he should be a defensive asset in center field. Big Z is the unquestioned ace of the Cubs pitching staff, a title he's arguably held ever since Mark Prior went down to injury back in 2004. And yet, this season was probably his worst since his rookie year in '02, and continues some disturbing trends that began last year. Zambrano's home run allowed rate was the highest of his career, strikeout rate fell this season since 2003, and his walk rate was above 4 bb/9 for the second consecutive season. His control was particularly a problem in the second half: he had a 3.9 bb/9 in the first half (and a 3.3 bb/9 in May and June), but a 4.6 bb/9 in the second half. When he's "on," Zambrano can be as dominant as anyone. But he's prone to collapse, particularly when he allows his emotions to overtake him. Inconsistent pitchers are generally more valuable that consistent pitchers, and he can turn in some outstanding outings--as evidenced by his playoff start vs. Brandon Webb in game one of the NLDS on Wednesday. But his meltdowns are also quite capable of putting a playoff game desperately out of reach over the course of a single inning. From a strictly statistical perspective, one can argue that Ted Lilly had a better season than Zambrano, and has had as much to do with the Cubs success this season as anyone else on the staff. In fact, at age 31 and in the first year of his contract, Lilly had the best season of his career. The difference? Walks. Lilly is not thought of as an overpowering pitcher, and yet his excellent curve ball has allowed him to routinely post 7+ k/9 strikeout rates throughout his career (career average = 7.65 k/9). He also has typically been a fairly extreme fly ball pitcher, and, in fact, this year he had the lowest ground ball percentage of his career. But his walk rate this year has been completely unlike anything he's done since his breakout 2003 year with Oakland. From '04-'06, he never once posted a rolling average walk rate lower than his season-average this year. It's the sort of improvement from which one has to expect some regression next season, but at the same time I wonder if he and pitching coach Larry Rothschild were able to modify something about his delivery to help him achieve these remarkable numbers. The Cubs' third best starter this season, despite the hot start by Marquis (see below), was easily Rich Hill. Hill, who is surprisingly already 27, took a while to finally land in the big leagues last season, but this year finally cemented himself as a ~#3-4 starter. Hill has a low 90's fastball and a tough curve, but mixes in a change and slider. This combination was very effective, allowing him to strike out 8.5 batters per nine innings this season. His biggest struggle is with the long ball, where his fly ball tendencies (37% this season, 32% last season) combined with Wrigley Field resulted in a fairly high home run allowed rate. Nevertheless, he's a solid pitcher who should be an asset in tomorrow's game. The Cubs' last two starters are Jason Marquis and Sean Marshall. Marquis started the season as hot as hot can be (relative to his history), but his peripherals showed evidence that little had changed compared to his prior year when he didn't make the pitching-poor St. Louis Cardinals' postseason roster. As a result, I had him shorted on Protrade for most of the year. :) His ground ball rate was actually much improved over the prior years this season, but his walk rates were still high and his strikeout rates were still low. His ERA never quite reached the 5.00 levels his FIP predicted all season, but it did steadily rise, and ultimately resulted in Pinella opting to bring back Zambrano on short rest in game four rather than allow Marquis to start. Marshall, 25, is seems like one of those protypical soft-tossing lefties with some history of control problems. He has five distinct pitches, and induces almost 50% of balls in play to be hit on the ground, but he doesn't strike many guys out and, while his walk rate was roughly average this season, he has a history of control issues in the minor leagues. I don't see him as much of a prospect, but he's probably an acceptable #5. He might show up as a situational lefty or long man in the postseason, but he won't be a common fixture on the mound. Ryan Dempster is a nice reliever, but a rather mediocre closer. He's almost certainly not the best pitcher in the bullpen, and might not even be in the top three. The former Red is a case study in how relieving is generally easier than starting. Now 30, his control struggles are still problematic, but are much less of a problem now than they were a few seasons ago. His strikeout rates continue to be above average, and his ground ball rates are very good. All in all, a nice guy to have in the pen, and perhaps not a bad guy to start the 9th inning with no one on base. But he's not the kind of power stopper that you bring in with runners on base in high leverage situations unless you have to. Fortunately, the Cubs have such a pitcher in Carlos Marmol. He has devastating stuff, which brought the 24-year old converted outfielder-then-starter a spectacular 95 strikeouts in 68 1/3 innings (12.5 k/9). BPro indicated in their report on him prior to this season that his change-up was quite hittable, but his PITCHf/x data indicate that he's completely given up on that pitch coming out of the bullpen and is sticking to his fastball/curve combination. He allowed so little contact that he allowed only a few home runs despite a very low ground ball percentage and above-average walk rates. His FIP (and especially his xFIP) indicates that he's not quite as good as his sparkly 1.45 ERA indicates, but anyone with a 12+ k/9 can be a real weapon. The other pitchers on the Cubs' staff aren't shabby either. Bobby Howry got a few save opportunities near the end of the season, and while he's a fly ball pitcher like many of his teammates, he posts good strikeout and walk numbers. Michael Wuertz posted strikeout rates second only to Carlos Marmol's, and is another excellent relief option from the right side. Lefties are represented by Scott Eyre, who has been durable over the past several seasons, but was extraordinarily wild much of this season. Southpaw Will Ohman didn't get as much playing time, but his peripherals were better than his ERA would indicate, possibly making him a better option than Eyre in LOOGY situations. Finally, Kerry Wood made a modest comeback over the last two months of the season out of the bullpen, posting fine strikeout rates but rather bad walk rates. His GB% was only 34%, which means that the fact that he didn't give up a home run in 24 innings has more to do with small sample size than skill...and xFIP indicates that once those home runs start flying out at a normal rate, his effectiveness may dissolve. The Cubs are a surprisingly solid-looking team team for a 0.525 club. Their offense is clearly their biggest weakness. They have some excellent hitters in Lee, Ramirez, and Soriano that can put up some big numbers with some help from their supporting cast. But at the same time, they had only four players (DeRosa being the 4th) who topped 10 runs over replacement on offense. The addition of Geovanny Soto might help, as might a break-out from Felix Pie or Matt Murton. But this is probably not a team that will consistently put up a lot of runs on offense. However, this is also the team that allowed the second fewest park factor-adjusted runs scored in the National League this season. They did it with a decent rotation, an excellent bullpen (especially middle relief), and a group of fielders who, while lacking clear defensive standouts, also lacked anyone significantly below average aside from Cliff Floyd. It's a team that I'd expect to match up pretty well with the overachieving Diamondbacks, at least when Brandon Webb isn't pitching. While any team down two games to none has a tough task in front of them, it would not be shocking to see the Cubs come back to force a game five. Thorough and accurate analysis of cubs season. Nice work!